Chocolatey Peanut Butter Protein Overnight Oats with Strawberries and Bananas! They are creamy, hot, and packed full of flavor! 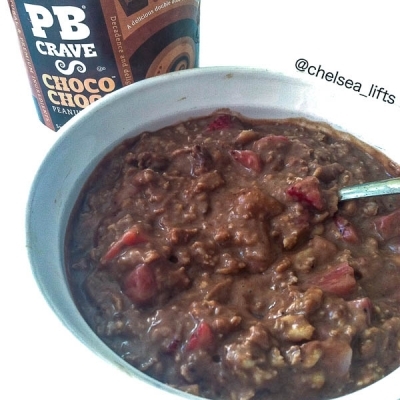 In an almost empty jar of PBCrave ChocoChoco Peanut Butter (Ingredients list shows Justin's Peanut Butter, but I used PBCrave), add all ingredients into the jar and mix well. Put in the fridge overnight to let the oats soak (about 10 hours). In the morning, remove from fridge and stir well, if necessary add in more water/almond milk if the oats soaked up all liquid. Put in a bowl and heat in the microwave for 2-3 minutes, or until heated throughout.